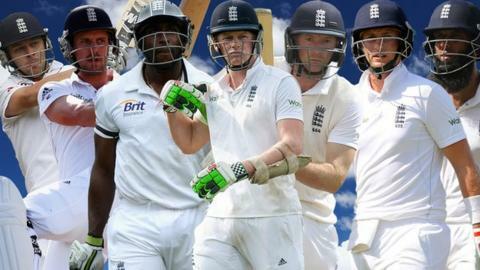 South Africa v England: Why can't England find an opening batsman? England is a nation of opening batsmen. Nine of the 25 most prolific openers in Test cricket history are English - more than any other nation. Six of those nine were fixtures in the side, so much so that in the 51 years since Geoffrey Boycott made his debut in 1964, at least one of Boycott, Graham Gooch, Mike Atherton, Marcus Trescothick, Andrew Strauss or Alastair Cook has opened in 79% (442) of England's 561 Tests. But that lineage appears, for now at least, to be in danger of dying out with Cook. Since Strauss retired in 2012, Cook has gone through seven different partners, with Alex Hales set to become the eighth in the first Test against South Africa starting on 26 December. How have England, the home of technically correct, gritty, sell-your-grandma-before-you-sell-your-wicket openers - raised against the moving ball on pitches greener than a snooker table - found themselves in such a state of flux at the top of the order? Cook's seven partners in the post-Strauss era have been Nick Compton, Joe Root, Michael Carberry, Sam Robson, Jonathan Trott, Adam Lyth and Moeen Ali. They could be divided broadly into four categories: the disastrous experiments (Trott and Moeen), the mistakenly promoted (Root), the faded early promise (Robson and Lyth) and the arguably hard-done-by (Compton and Carberry). The nine matches given to Compton are the most any of Strauss' successors have managed at the top of England's order. Is that really long enough to feel at home opening the batting in Test cricket? "It takes a while for the person to get used to that role," said former England captain Alec Stewart, who would have been higher than 11th on the list of run-scorers among English openers had he not been given the wicketkeeping gloves for 82 of his 133 Tests. "It needs the selectors to be brave enough to stick with the person who they think is the answer. If you're always searching after four or five games, you will always be looking." The statistics also suggest that England have been too eager to hit the eject button. In the period between Strauss retiring and 30 November this year, England's average opening partnership was 35.42, better than all but Australia, India and Bangladesh. It is also only five runs fewer than Cook and Strauss - opening partners when England rose to the top of the world rankings - averaged together. "You could say the selectors have bought it upon themselves," added Stewart. "If you are leaving people out after just a handful of games, the selectors are saying they have made an error in who they selected. "Should they have given that person more time or should they not have picked that person in the first place?" If most of the seven players tried post-Strauss hinted at having the tools to open long-term, it can also be argued the selectors were not totally mistaken. Talent has been identified and, in most cases, flourished early on. Then, for various reasons, the promise has petered out to the point at which each man had to be removed. Trott retired, Moeen is likely to return to number eight and Root is an anomaly in that he still averaged 37 opening the batting despite appearing much less comfortable than in the middle order. Robson and Lyth both showed weakness around off stump, Compton somehow became both shotless and frenetic, while Carberry also gradually retreated into his shell, before becoming a victim of the post-Ashes whitewash clear-out. Speaking in April 2014, three months after his last Test match, Carberry, who went on to play only one more one-day international and one more Twenty20 game for England, said he had not heard from the selectors. "It's disappointing but it's the way they tend to do things," said the Hampshire left-hander. "I don't think it's me alone saying this sort of thing. There have been players before me and players now who have felt the same thing." Is Carberry the exception, or the rule? Is a dropped player given the advice he needs to succeed at Test cricket? "A lot of the players we've tried haven't got the defensive technique," said BBC Test Match Special summariser Boycott. "But have we done anything to improve them? "Have we done anything to help them? Have we shown them all the details of how they've played? Has anyone sat them down and gone through it?" County pitches too good? Or not good enough? Any assumption that the inability to find a Test-quality opener is because top-order batsmen are not pulling their weight in county cricket would be incorrect - the percentage of runs scored by openers in the County Championship has held steady around 25% every year since 2000. However, the type of first-class cricket played in England could be a hindrance to would-be international openers. As for why, that depends who you believe. To Boycott, pitches in the Championship are now too good. Scoring is too easy and not conducive to honing a technique that will succeed at the highest level. "The County Championship isn't as strong as it used to be," said Boycott. "Pitches are flatter and better. "They don't have to learn to play the moving ball, which means a dearth of quality opening batters when they get higher up into Test cricket." However, Boycott's fellow Yorkshireman Michael Vaughan states the problem is the exact opposite - surfaces aren't good enough. "Pitches do so much that 70 or 80mph wobbly bowlers run up and hit the seam and the ball goes either way," said ex-England captain Vaughan, also a TMS pundit. "Openers see these pitches and have a dash. It inflates the value of a quickfire 30 or 40. Therefore, they haven't got the technique or the mindset of a Boycott to bat for seven hours." It seems the England and Wales Cricket Board agrees with Vaughan. Their decision to scrap the mandatory toss in the Championship next season should, in theory, discourage home teams from producing pitches that overly favour seam bowling. Not that any change to the Championship will help Hales with the imminent task of making his Test debut against South Africa's Dale Steyn and Morne Morkel, probably the best new-ball attack in the world. Indeed, the decision to pick Hales - other than the fact he is simply the next cab off the rank - is an indication that the selectors have turned away from performances in county cricket and instead gone for a man who has shown flashes of brilliance in limited-overs internationals. Though the Nottinghamshire man's career first-class average is only 38, he has hit England's only T20 international century and made his maiden ODI ton against Pakistan in November. England are perhaps hoping Hales can become their answer to David Warner, who progressed to Tests via white-ball cricket for Australia and has been the world's outstanding Test opener since he made his debut in 2011, averaging 50.64. "He has to play his way, the way he does at county level," said Stewart. "But you have to be aware you get more good balls and fewer bad balls. At times the rate of scoring will change, but it's still a red ball coming down the pitch at you. You watch it and play it on its merit. "My big thing was to remember that you're in charge. You're the boss whether you're defending or scoring. Play the way that has got you into the set-up." England are unlikely to worry about Hales' method, just the amount of runs he scores. He will most probably get all four Tests in South Africa to claim the job of partnering Cook as his own. If he fails, then every county opener will be alive to the possibility of playing for England in 2016. Just as they were in 2015. And 2014. And 2013.